Searching for the perfect surface for doesn't have to be difficult. Here are some pointers about the most popular countertop materials. "If you pick a granite that's relatively easy to get, it could be affordable. If you pick a granite that I have imported from Zimbabwe, and [it] only ships once a year, that can be pretty expensive," Jeff says. Engineered stone countertops come in a wider variety of colors than natural stone countertops, are more durable and are a cinch to maintain. They're "just bulletproof," Jeff says. However, engineered stone won't save any money over granite: the two materials cost roughly the same. 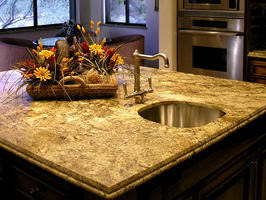 Concrete countertops, which can be completely customized with pigments, are gaining popularity. Concrete is available in several different finishes: trowel (smooth), ground (sanded to expose the sand aggregate) and pressed (a tool is used to reveal marblelike veining). Extreme or abrupt changes in temperature may cause concrete to warp or curl, damp sponges left on the counter can cause discoloration and acidic spills may etch the surface. To keep a concrete countertop looking its best, it's advisable to seal them it to four times per year and wax with a paste every two to three months. Can't decide on just one material? Then mix and match surfaces. In her designs, Sarah Ann Busby, owner of Sarah Busby Designs in Elk Rapids, Mich., often uses a different material on islands than the rest of the countertops to differentiate the space. Another option is to inset another material into a countertop for specific tasks. Butcher block is common for chopping as is marble for baking. Before making a decision on countertop material, see the surface in person, whether that means visiting a showroom or viewing samples in-home.